There’s no better place to welcome in the New Year in style than Beaufort House Chelsea. 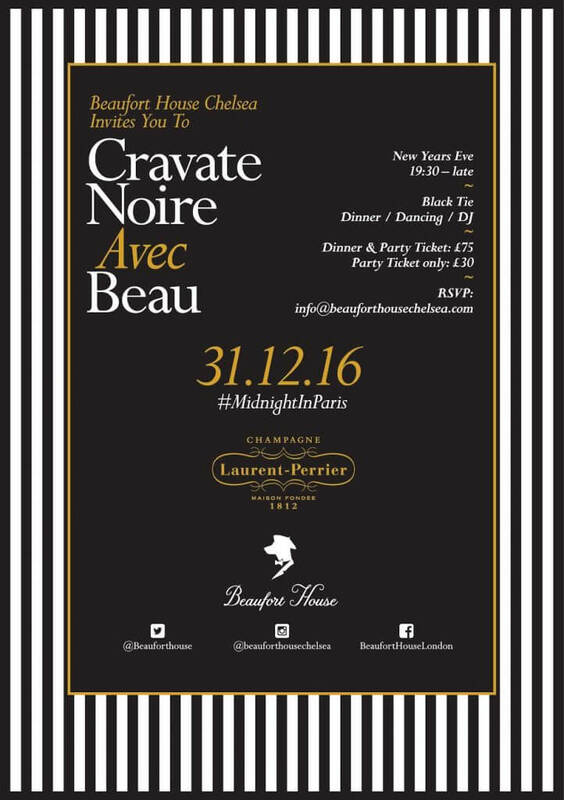 This New Year’s Eve, we are delighted to present Cravate Noir Avec Beau – an evening of Parisian elegance and fun with eating, drinking and dancing until the early hours. The evening will begin at 7.30pm with a sumptuous five-course meal, as guests will be treated to an array of culinary delights including Pan Fried Scallops with Ginger Bread Crumbs, Fillet of Beef and a delicious Chocolate Gateau. Welcome in 2017 with family and friends, as we build up to midnight with fabulous DJ’s on each floor of the house. So dress to impress, dust off your dancing shoes, and join us at The House the best New Year’s party venue in the heart of Chelsea.